Key element to clearly compute the impact of TV campaigns in digital, the baseline models what the natural traffic could have been without any TV spot. Realytics models 3 different baselines for all of its solutions. Discover how in this article! At Realytics, we define the direct baseline as the value of the traffic appearing during that period (window of analysis) in absence of a spot. Thus, the direct impact is defined as the increment of traffic that is directly attributable to the spot itself (during the impact window). This increment is calculated as the difference between the generated traffic and the computed direct baseline. The calculation of a spot starts through the opening of an analysis window. Then, Realytics’ algorithm considers 20 minutes before and 20 minutes after the end of the impact window without any spot. If a spot was aired during that period, the algorithm searches until it finds 20 consecutive minutes without the impact of any spot, to model and run a linear interpolation of the traffic. It is most important to look at the traffic in the minutes closest to the spot airing, to give the proper weight to this period, and ensure that the baseline and realistic impact of each spot is reflected. • The advertiser has a strong concentration and density of spots being aired during several consecutive analysis windows (leading to an extension of the analysis windows). In these cases, a special baseline is modelised ad hoc in accordance with the traffic movements. The data science team at Realytics has developed a special algorithm that can treat more difficult traffic situations, and is able to model a clear baseline even when the traffic isn’t linear. The underlying algorithm differentiates step-by-step between the “exogenous” traffic, the noise, and the impact due to spots, and consequently adjusts the level of the baseline accordingly. First of all, what is the indirect impact? It is the incremental traffic observed during the TV campaign and the weeks following it and that is not attributable to one specific spot. 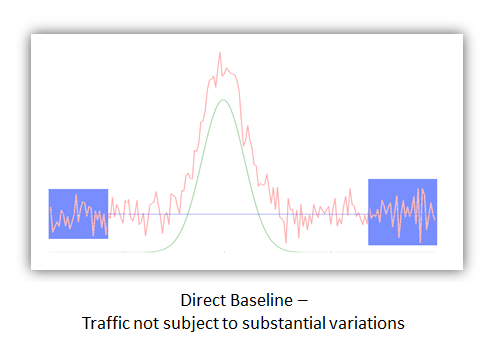 The indirect baseline is modelised based on a time series approach and it corresponds to what the traffic would have been without any campaign. It allows to compute the long-term increment which is not attributed to the direct impact. The algorithm uses as much Realytics’ tracking data as possible. 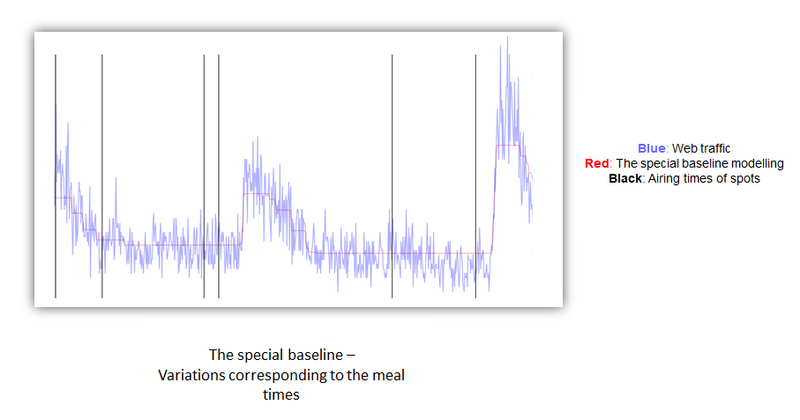 It applies time series technics to model long- and short-term patterns of the traffic for the duration of the campaign. Therefore, the tracker should ideally be installed as early as possible before the campaign starts (3-4 weeks advised, minimum of 2). You get it: the more information Realytics has about your traffic history, the better the measure will be.